BBC NEWS | UK | Magazine | Why bring on the clowns? Why bring on the clowns? Workshops on face painting... sessions making lollipops... the World Clown Association's annual convention promises more fun than most industry shindigs. But who needs clowns nowadays? At a hotel in Albuquerque, New Mexico, staff are preparing for the arrival of hundreds of clowns from around the world, including the UK. For five days, the complex will play host to speeches, seminars and classes on better clowning and how to best amuse your audience. It's a serious business. Clowns have bravely tried to entertain the masses for centuries, appearing before huge crowds and earning celebrity status in their heyday. 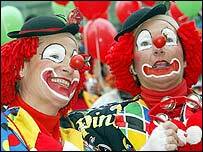 But time are hard for today's clowns, who are more likely to need a second job to bolster their income. Making balloon animals for children hooked on computer game adrenaline can be slim pickings. The industry's image is not helped by Krusty the Clown, the corrupt, drug-abusing misanthropist from the Simpsons, who has arguably become the world's most famous exponent of the art. Even Clown Bluey, secretary of World Clown Association affiliate Clowns International, says: "There's not many clowns that actually make me laugh, personally." The challenges of appealing to modern audiences will be on the minds of those clowns gathering in the US. They are well aware that throwing custard pies and squirting water through fake flowers is not going to compete with the wealth of entertainment available to the average family. The workshops on offer need to prepare a new breed of multi-tasking clowns, equipped with the diverse skills required in a world of parties, shop openings and corporate events. So there's make-up design, "entertaining with balloons and hats", mime techniques and comedy writing classes on the first two days alone. As the week progresses it's time to move on to "10 ways to make magic funny", "Clown hat as your friend", rope tricks and even the evolution of clown costumes. "Nowadays clowns are expected to do more, like puppets, balloon modelling, plate spinning, juggling and so on," says Clown Bluey. "A lot of people make the mistake that it's just putting a costume on." Of the 300 or so clowns in the UK around 50% work full time, says Clown Bluey, who came to the UK from New Zealand in 1969 and appeared in front of royalty at the Royal Albert Hall in his first performance. "A very high proportion have never worked in circus," he says of his contemporaries, pointing to the decline in popularity of the troops of clowns who worked the rings in previous decades. "There's a high proportion who are party clowns for children and so and they make a full time job of it," he says. "Others do shopping centres, fetes and galas and so on." "The public need clowns to soften the gloom a little bit," he says. But it can be a hard life. "The clowns that do children's parties have my greatest respect," says Charlie Caroli, 34 years in the business. "If you are bad, adults will just sit there and say 'how long's he going to be', but kids will just walk off."